Dakar Rally 2017 is a tough challenge both for racers and trucks. The route will stretch across Paraguay, Bolivia, and Argentina. The famous large-scale rally kicks off on January 2 in Asuncion and comes to an end on January 14 in Buenos Aires. InstaForex Loprais Team will traditionally take part in the Dakar adventure. 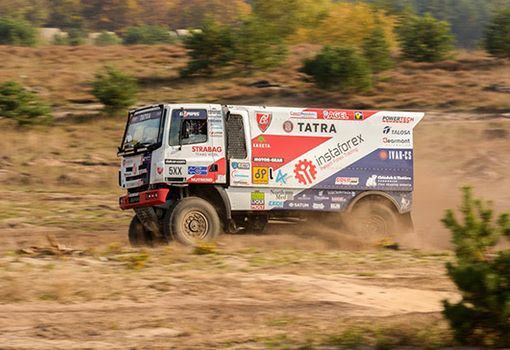 This year, our team headed by Ales Loprais is going to compete on Tatra Phoenix, the new state-of-the-art truck, specially designed for the off-road rally. The other good news is that Ales Loprais and Martin Kolomy combined their efforts under a new joint venture called InstaForex Tatra Buggyra Racing Formation. They have already passed several test drives in Slovakia and Hungary. Mechanical fine-tuning included adjustment of shock absorber settings, replacement of truck’s electronics, and installation of a new turbocharged engine. A lot of trucks will drop out of the race. With Tatra Phoenix, our team gains an advantage in speed. Competitors will face severe obstacles along the route to Buenos Aires. For example, in Bolivia the trucks will have to overcome the high altitude dunes at around 3,500 meters. Both racers and mechanics will have to test their endurance. The odds are that Ales Loprais and Martin Kolomy will showcase their racing skills in tandem and reach the final destination. One month is left before the major event among rally adventures. Our team with their Tatra Phoenix is already half-way to Paraguay. They are anticipating a 12-day off-road race across impassable routes of South America. Follow the updates of Dakar Rally 2017 and root for InstaForex Loprais Team!